Octuplets are a set of eight offspring born at one birth. 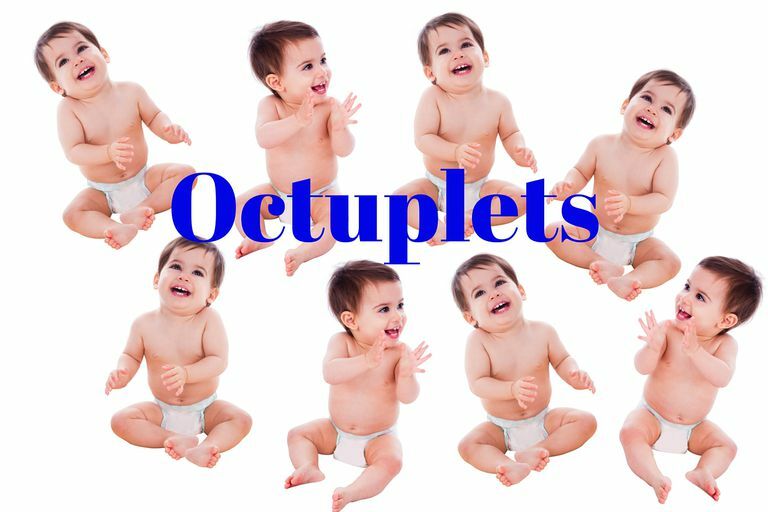 An individual that is part of such a set is called an octuplet. Octuplets can be fraternal (multizygotic), identical (monozygotic) or a combination of both. Multizygotic octuplets occur from eight unique egg/sperm combinations. Monozygotic multiples are the result of a fertilized egg that splits into two or more embryos. It is possible for the split to occur more than once, producing monozygotic triplets or potentially even a set of monozygotic octuplets, although none have been documented. It is also possible for octuplets to include one or more sets of monozygotic twins among the six individuals. Octuplets can be all male, all female, or a combination of both. Monozygotic multiples will always be of the same gender. Although several octuplet births have been recorded, only five sets include any living survivors, and only one set includes all eight surviving babies. Very few incidences of spontaneous conception of octuplets have been reported; nearly all of the extreme multiple births in the last 30 years were the result of fertility enhancements such as ovulation-stimulating drugs. Octuplets do not necessarily have to share the same birthdate. A delayed interval delivery (also known as iatrogenic asynchronous birth) may mean that individual babies are born days or even weeks apart, such as the Chukwu babies born in 1998. Because octuplets are so rare, information is scarce as to the average gestation or other details of pregnancy. However, all incidences of octuplets have been born prematurely, before the 40-week gestational period for a full-term singleton baby. In January 2009, the California octuplets were born a little past 30 weeks. By contrast, the Chukwu babies born in 1998 were delivered at only twenty-seven weeks. As in a pregnancy with five or six babies (quintuplets or sextuplets), a mother may gain 50-100 pounds, depending on how long she is able to carry the babies. A cesarean delivery is necessitated in the event of an octuplet pregnancy. Because the babies are born prematurely, they are quite small. The largest known size for an octuplet was one of the babies born in California in 2009, weighing 3 lbs. 4 oz. None of the Chukwu babies weighed more than two pounds. Other higher order multiples have been widely followed in the media, such as the Dilley "Six Pack" sextuplets born in 1993 or the television series Jon & Kate Plus 8 which documented the daily life of the Gosselin parents who have both twins and sextuplets. While great media attention was focused on the birth of octuplets in January 2009, details about the family have remained relatively private. In addition, the Chukwu/Udobi family from Houston has shunned the spotlight for the most part. Many parents of octuplets are urged to consider selective reduction, reducing the number of viable fetuses to two in order to protect the health of the mother and give the babies the best chance of survival. In 2009, doctors thought that the mother was pregnant with septuplets and were surprised by an eighth baby in the delivery room. Runabout crafts multi-seat strollers with hand-welded steel frames and manufactures a model with eight seats, primarily for schools and child care centers. They are quite expensive. Four-, five- and six-seat strollers are available and could be used in combination to transport eight babies.